LONG BEACH, CALIFORNIA – January 17, 2019 – Stars + Stripes Team USA, American flagged Challenger for the 36th America’s Cup presented by Prada, today released additional details outlining their boat build and design process. This information comes less than one month after the team revealed, as part of their entry announcement, that construction of their AC75 race yacht was already underway. “Since our entry announcement, the level of support we have received for an all-American team has exceeded our expectations,” said Stars + Stripes Team USA CEO, Justin Shaffer. “From day one, we have seen an opportunity to create a sustainable legacy in American boat building and yacht design on our path to win the America’s Cup,” said Shaffer. As part of the team’s strategy to learn from industry experts, Stars + Stripes Team USA purchased a design package for their AC75 race yacht from Emirates Team New Zealand which immediately placed the team in a competitive position with respect to the boat build and design process for AC36. Stars + Stripes Team USA also has the option to purchase an additional basic design package for their second boat that can be modified with the team’s final race performance enhancements (under the 36th America’s Cup protocol teams are restricted to building only two AC75’s). Throughout the build and design process, the design package also allows for Stars + Stripes Team USA designers to learn from the ETNZ design team, the same team that developed the revolutionary foiling monohull concept. Using this platform as a starting point, the Stars + Stripes Team USA design team, led by JB Braun, has been able to focus on innovative performance solutions to improve upon the design package in areas including appendage design, software, and sail design, amongst others. Recent hires to that design and build team are Senior Engineer Alon Finkelstein, who immigrated to the States 20 years ago and joins the team after 15 years with Farr Yacht Design and 3 years with Oracle Racing, and Lead Construction Manager Dennis Gunderson from Maine, who has versatile project management experience in the boat building industry from classic yachts to carbon fiber super yachts. Also joining the team as Performance Analysis Machine Learning Lead, is America’s Cup veteran Bryan Baker from Cohasset, MA who brings a robust background in computational fluid dynamics modeling and performance prediction to the design team. “The ability for us to grow American talent in learning how to design and build foiling monohulls was key in our negotiations for our design package prior to our entry,” explained Shaffer. “In addition, we have made it well known that it is our full intention to take advantage of the competitive edge from this package and use it to win the Prada Cup and ultimately the America’s Cup in 2021." Key to this advantage is a design partnership with North Technology Group that will have Stars + Stripes Team USA collaborating closely with their design team and construction engineers in Minden, NV to develop new technology. The decision for North Sails to supply sails and design resources for Stars + Stripes Team USA has been spearheaded by Braun, who in addition to his role within the team, also serves as the director of design and engineering for the world’s leading sailmaker. “Each Cup cycle produces an influx of design and technology, which keeps North at the forefront of material and design software innovation,” said Braun. Ken Read, President of North Sails, echoed the North Sails commitment to advancing sail design and technology, a pillar for the Stars + Stripes Team USA campaign. “We are proud and privileged that our world-leading people and products have once again been chosen as the best of the best,” said Read. 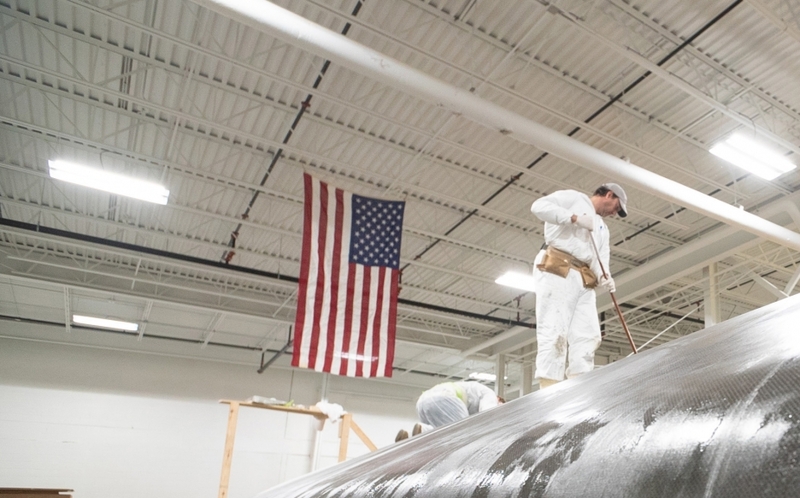 Stars + Stripes Team USA is now able to confirm that they are building the team’s AC75 at Composite Builders in Holland, Michigan and that they have retained legendary boat builder, Tim Smyth to advise on the build. “The choice of Composite Builders was an easy one for us; we are grateful to build our boat in Michigan and Tim’s consult has helped our team get up to speed quickly,” said Braun. Brian MacInnes, founder and CEO of Composite Builders and veteran of multiple America’s Cup and Volvo Ocean Race campaigns, said his shop was enthusiastic to support Stars & Stripes Team USA’s grassroots approach. “To date we have brought together over twenty American boat builders for Stars + Stripes Team USA’s AC75 build,” said MacInnes. Stars + Stripes Team USA will soon be announcing details around the application and tryout process for American athletes and support personnel wanting to be part of the team. American boat builders and those interested in apprenticeships are encouraged to apply. Stay tuned to Stars + Stripes Team USA social channels and sign-up for the team newsletter at starsandstripesteamusa.com for more updates.